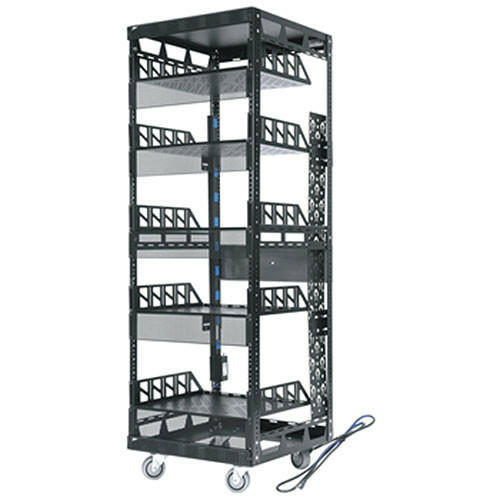 The Middle Atlantic Slim 5 19" Equipment Rack (14 Space) is used to house multiple equipment, uses anodized trim panels, and has an overall depth of 20” (508 mm). Including 2 pairs of fixed position 11-gauge threaded 10-32 front and rear rack rails, the rack provides a firm and secure housing, by employing mechanically interlocked corners and heavy-duty 14-gauge steel top and bottom. It also provides a static load capacity up to 1000 lb (453.6 kg) and UL-listed capacity of 400 lb (181.43 kg). Featuring 0.5” (12.7mm) and 0.75” (19mm) electrical knockout points on top and bottom rear respectively, the equipment rack offers easy cable management and allows you to gang together your cables with or without the optional cable chase. It allows for attachment of 2 fans at the top for cooling your equipment. Providing a professional look with a durable black powder coat, the rack features a ready-to-assemble design. Box Dimensions (LxWxH) 38.0 x 36.0 x 24.0"